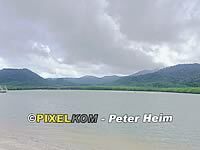 Virtual Travel & Island Guide about Salak Khok Bay on Ko Chang in Thailand. 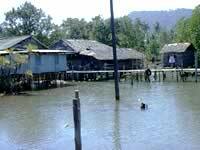 Salak Khok Bay (Aow Salak Khok) is situated in the southern half of Ko Changs east coast. The bay is approximately 1 kilometre wide, up to 2 kilometres long and only connected to the sea by a narrow passage. 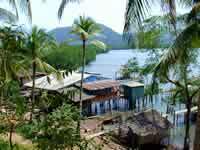 It is very flat and the biggest part is scattered with islands of mangroves. 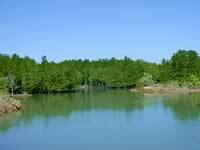 It is apparently one of the best-preserved mangrove-forests in the whole of Thailand. In 2005 a concret bridge was built through parts of the mangrove-forests, the so called "Mangrove walk". On the tour you will find signs with all information about the mangroves and the animals living there - very interesting and absolutely commandable! Also organized kayak tours can be made through the mangrove-forests - just look for the signs at the road in the village! 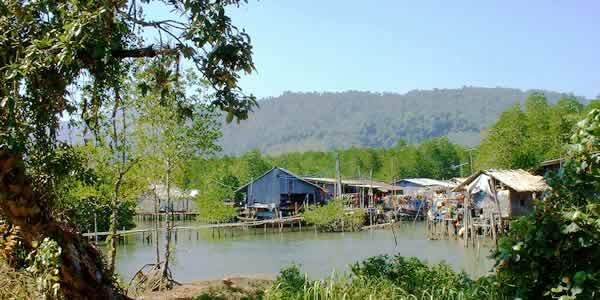 The quiet fishing village Salak Khok (Baan Salak Khok), located at the southern edge of the bay, is built, to a large extent, on stakes into the bay and many of the houses are connected with small timber bridges. Besides there is a school and a temple located outside the village. At the end of the bay there is a small viewpoint, from where you have a beautiful view into the Salak Khok Bay (see the 360° VR above, more information here: 'What to do on Ko Chang? ', 'Viewpoints on Ko Chang'). As far as we know there was no regular taxi service from the west coast of Ko Chang to the "Baan Salak Khok" at the end of 2009. So you have to go there by hired motorbike or car or by organized tour. You must turn left at the intersection of the main street, which is 14 kilometres south of Dan-Kao-Pier. After nearly a kilometre the road forks: the left road goes to "Baan Salak Khok", while the right leads to the south to "Baan Chek Bae", "Koh Chang Remembrance" and "Long Beach". Taxis to the piers and/or the west coast of Ko Chang are not easy to get, so you should better ask in one of the few resorts. Accommodation is available in Baan Salak Khok. (Specifications: 2009) All 360° virtual reality panoramas, photographs and panorama pictures from April 2005.